Beehive mill was built on the offside of the Macclesfield canal by bridge 28, where the house with the wharf is today. 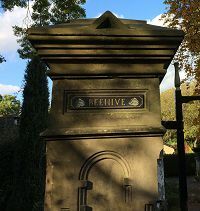 It is thought to have been erected in about 1862. It was five floors in height and occupied by the Bollington Cotton Spinning and Manufacturing Co Ltd. of which the principal shareholder was one of the Mellor family. 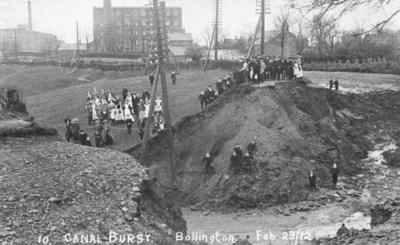 In the picture of the 1912 canal breach, Beehive mill can be seen at the top of the picture behind the telegraph pole. By 1889 the mill was for sale. The mill was standing in 1912 but was demolished within a few years. Today all that remains is the wharf and two gate posts with the names ‘Beehive’ and ‘Mill’ marked on them. A domestic house now stands on the site.